Composed in the summer of 1887, the piece was Brahms’ (7 May 1833 – 3 April 1897) final work for orchestra. It was premiered on 18 October of that year in the Gürzenich in Köln, Germany. Brahms approached the project with anxiety over writing for instruments that were not his own (he was a virtuoso pianist). He wrote it for the notable 19th-century German cellist Robert Hausmann (13 August 1852 – 18 January 1909), a frequent chamber music collaborator, and his old but estranged friend, the Hungarian violinist, conductor, composer and teacher Joseph Joachim (28 June 1831 – 15 August 1907). The concerto was, in part, a gesture of reconciliation towards Joachim, after their long friendship had ruptured following Joachim’s divorce from his wife, contralto Amalie Schneeweiss (stage name: Amalie Weiss, 1839–99). Brahms had sided with Amalie in the dispute. In 1884, Joachim and his wife separated after he became convinced that she was having an affair with the publisher Fritz Simrock. 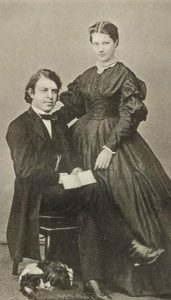 Brahms, certain that Joachim’s suspicions were groundless, wrote a sympathetic letter to Amalie, which she later produced as evidence in Joachim’s divorce proceeding against her. 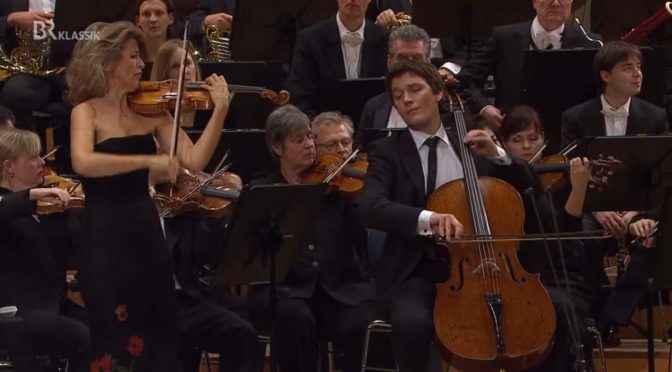 This led to a cooling of Brahms and Joachim’s friendship, which was not restored until some years later, when Brahms composed the Double Concerto in A minor for violin and cello, Op. 102, 1887, as a peace offering to his old friend. It was co-dedicated to the first performers, Joachim and Robert Hausmann. When writing to Clara about the double concerto, he said “unfortunately Joachim has given up composing”. Joachim and Hausmann repeated the concerto, with Brahms at the podium, several times in its initial 1887-88 season, and Brahms gave the manuscript to Joachim, with the inscription “To him for whom it was written.” The German musician and composer, considered one of the most distinguished pianists of the Romantic era, Clara Schumann (the wife of the composer Robert Schumann, 13 September 1819 – 20 May 1896) reacted unfavorably to the concerto, considering the work “not brilliant for the instruments”. Richard Specht also thought critically of the concerto, describing it as “one of Brahms’ most inapproachable and joyless compositions”. Brahms had sketched a second concerto for violin and cello but destroyed his notes in the wake of its cool reception. Later critics have warmed to it: Donald Tovey wrote of the concerto as having “vast and sweeping humour”. It has always been hampered by its requirement for two brilliant and equally matched soloists.